We Specialize in kiddies theme birthday parties. We will work with you to ensure that your little one's special day is everything they wished for by providing a professional and trouble free service. 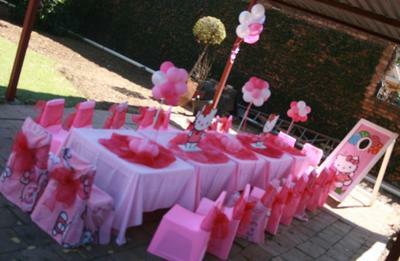 We will organise your child's Birthday from the Decor to the Cake, Party Packs to the Jumping Castle. We have affordable Packages that you can choose from, or you can simple hire out the Items you need. We also provide Catering for both kiddies and Adults.